← What is the alternative? In a strategic move by the Elad nonprofit organization, dozens of young Jewish settlers [sic] entered some 25 apartments in seven buildings in the East Jerusalem village of Silwan on Monday night. This was the largest influx of settlers into buildings in that part of the city in 20 years. The settlers’ entry was accompanied by police officers and privately hired security guards. Most of the buildings were empty, and thus there were no confrontations with Palestinian residents after the settlers arrived there. In one building, however, there were residents who resisted and the Jews retreated. In another case, a confrontation broke out between a young Palestinian and the new tenants, and police separated them. The newcomers have locked themselves in the buildings and they are being guarded by the police. As in similar incidents in the past, the right-wing Elad organization is hiding behind a company registered abroad — in this case, Kandel Finance. Attorney Avi Segal, who represents the firm in Israel, would not provide any details about it or about the process involved in purchasing the property. The takeover of buildings earlier this week in Silwan occurred at the end of the most violent summer East Jerusalem has known in decades. Settlers living in that part of the city, who have been suffering from attacks of stone-throwing, firecrackers and firebombs almost every evening, complain that the police are ineffective in dealing with the Palestinian youths involved. For their part, police officials have expressed optimism in recent days regarding an impending end to the wave of violence. 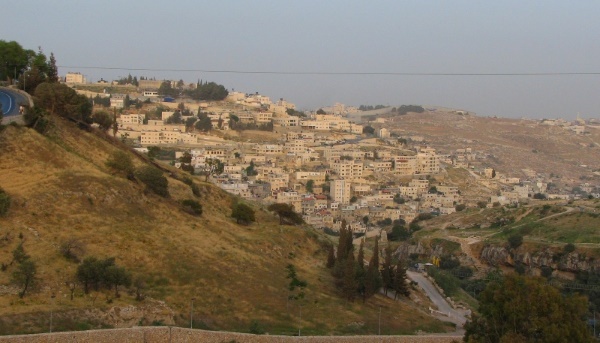 Over the next few days, it will become clear whether the influx of new Jewish residents in Silwan will thwart progress toward a calmer atmosphere. Do you see what the duplicitous Zionists are trying to do? They are permitting Jews to live in a part of Jerusalem which Arabs have decided must remain pure! Silwan is in eastern Jerusalem, which the Jordanian army wiped clean of Jews in 1948. And now the Zionists are bringing them back. They are creating, God forbid, a mixed neighborhood. The Arabs have decided that any part of the land which was illegally occupied by Jordan for the 19 years following Israel’s independence belongs to them. And one of their rules appears to be that a Jew may not live on ‘Palestinian land’ (in fact, in the Palestinian Authority there is a law that forbids Arabs, on penalty of death, from selling land to Jews). I should point out that the reason the organization that bought the buildings won’t release any details is that even in Jerusalem an Arab who sells to a Jew is likely to be murdered. Eastern Jerusalem, although many people like to pretend it isn’t, is part of Israel. It was part of the land the Palestine Mandate earmarked for a Jewish national home. It came under Israeli control in 1967, and it was formally annexed in 1980. Arabs living there can have Israeli citizenship if they wish, or they can remain permanent residents with all the benefits of citizenship except voting, if they want to make a political statement (personally, I would like to see them swear loyalty to the Jewish state or get out, but that’s just right-wing extremist me). By the way, Ha’aretz, the use of the word ‘settler’ for a Jew living in Israel’s capital is particularly offensive. I am expecting to hear that the US State Department, the EU and others find this action ‘unhelpful’ or worse. But I ask: who are the racists here? Who is trying to introduce apartheid? And who chooses to use violence? This entry was posted in Israel and Palestinian Arabs. Bookmark the permalink.